to make your event GREAT! Please choose your preferred date. "Thank you for making Brian’s birthday celebration so terrific – he enjoyed it, his friends enjoyed it, the adults enjoyed it, his father & I enjoyed it." Your Child and Their Favorite Character STAR In An Interactive Show That Brings Your Theme To Life! Watch their eyes light up as the kids meet their favorite character! 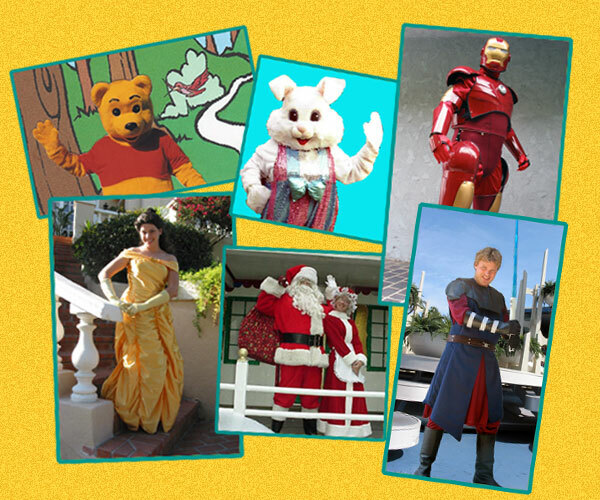 We offer a HUGE SELECTION of popular characters to fit most any theme! From SUPER HEROES and PRINCESSES to CARTOON and HOLIDAY CHARACTERS, our performers are sure to bring your party’s theme to LIFE!!! –Are HIGHLY TRAINED PROFESSIONAL CHILDREN’S ENTERTAINERS that are carefully cast to depict the character that they are playing. –ENHANCE THE THEME OF ANY EVENT by adding live entertainment tailored to complement your party. -Provide a VARIETY OF SKILLS & ACTIVITIES to keep the kids entertained. *some activities may not be available due to costume limitations, time available, and the number of children.